My She Shed: For Me, About Me, with Me All Over the Place. I put some new items in my portfolio file and read over some of the newspaper columns that I wrote from 2008-2010. Good stuff in those : ) Since my move in December, I’ve poured over many boxes of folders with past project files and samples with the intention to get organized. I didn’t throw out a thing, ha ha! What I DID do was enjoy every piece of art, every magazine and brochure design, every photo, all over again and gently placed each back in it’s folder or box. It’s been 5 years since I came out of the “rat race”, as I call it. My work and personal lives are completely different than that day I walked out of an office building for the last time. The building that held many end products, successes, failures, should haves, would haves and could haves. That “Leap of Faith” thing? I took it. And I would do it all over again. As a consultant I am in charge of me. Not an easy job and still a challenge everyday. The best thing that has happened for my career and the management of “me” is my own space. My She Shed. Men have their man caves, and now women are getting their own special spot: She Sheds. The idea, which has been gaining steam across Pinterest as the weather warms up, is that women transform backyard sheds into a hideaway where they can escape the daily grind. We took the idea a step further and instead of taking over the lawn mower and fishing tackle’s house, we built a shed with the intention of creating an office space. It’s an office, only awesome-er. It’s not brick with four walls and a couple of windows like the typical vision we have of someone’s office. It’s a tiny house, planned and designed with love, with french doors that open onto the back patio. 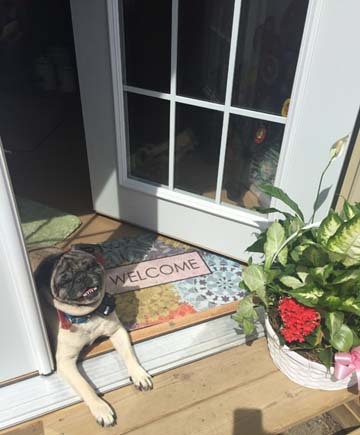 Doors that are open right now to let the sun shine in, the sounds of the birds, wind chimes, neighborhood activity and my two furry office mates, my pugs, Brutus and Gabby. It’s full of my office furniture, only brighter and more colorful…and a fireplace topped with a big screen tv. I have soft jazz playing when I’m a designer or a writer, and louder, 80’s favorites, when I’m organizing files. My She Shed is me. It’s a place to find quiet and read. It’s a place to hold creative meetings. It’s a place to create professional projects or just draw on a tablet. It’s a place for me, about me, with me all over the place. It holds a different “vibe” than that of a typical office or even the house and my old home office. It’s designed to be that way…to let the creative grow and flourish. You’ve probably never heard of a She Shed before. But, you should definitely have one.